Rotating mast - worthwhile performance gains? For your average less than 20 foot beach cat with an aluminum spar, just how much of a performance gain do you get from having a mast that rotates? No doubt for a wing mast it's critical, but since most aluminum extrusions are very nearly round and not primarily designed to be rotated anyways, is it worth the additional complexity? 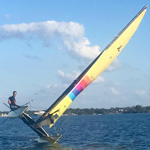 There’s a reason why Hobie put a rotating mast on the Hobie 14 fifty years ago and virtually every beach cat since has had a rotating mast - better performance. I really can’t see any reason not to use one. I think you would have just as much difficulty designing a mast step that prevents the mast from rotating as one that allows it to rotate. It makes all the difference in the world on my boat. The new sq top really rotates the mast. I can tell the difference if the mast hasn't rotated after a tack and then rotates. Edited by gahamby on Nov 16, 2018 - 11:16 AM. In light air I often have to manually rotate the mast. There is a significant and instant increase in power once rotated into correct position. Stiletto 27 on a 2 year repair plan. I had a rotator arm on my Nacra 5.7, which allowed one to lock, limit, or force rotate the mast to any desired position. You could destroy the power in the sail by not allowing it to rotate between tacks. The masts, even on legacy beach cats, are nowhere near circular, & if not pointed into the relative wind, (or some reasonable angle of attack), the telltales will be anywhere but streamlined, with a resulting loss of power. Edited by Edchris177 on Nov 16, 2018 - 10:06 PM. know is that it works!!! How exactly is a rainbow made? How exactly does the sun set? How exactly does the posi-trac rear end on a Plymouth work? Edited by martyr on Nov 17, 2018 - 03:12 AM. Edited by ziper1221 on Nov 19, 2018 - 02:16 AM. It's interesting that no one has mentioned the fact that a rotating mast is used to help shape the the mainsail. The cross section of the mast being teardrop shaped will allow the mast to bend more when allowed to rotate more. When the mast bends it pulls a big section of the main forward flattening the sail. I’ve seen the flow tests that show a tear drop basically does jack crap at keeping attached flow behind the mast regardless of how it’s rotated. The shape of the sail and how you rotate to optimize that accounts for way more drag reduction. Thus the thinner wing mast was invented that can actually keep flow attached.